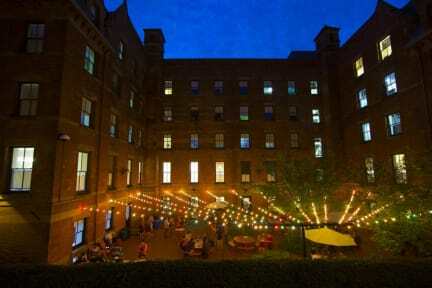 Hostelling International New York has been praised by many of our visitors for their sociable atmosphere. Our guests say their staff are 'very helpful and welcoming', they have 'good communal areas to mingle' in and 'they offer a lot of extra activities (tours, trips) which are value-for-money'. There's two metro stations within two blocks, connecting directly to the Lincoln Centre, Times Square, Penn Station, Brooklyn and Soho. We like their large sunken patio - a rare space to stretch out in Manhattan. I was surprised for the amazing place. Friendly staff, nice atmosphere, confortable bed, clean restrooms, great location. I will definitely go back. Strongly recommended for backpackers. Second time I've stayed in this hostel, definitely the best one I've stayed in by far. Very close to subway and the cafe has great food. Beds are surprisingly comfortable for a hostel. Only downside is the showers aren't the best water pressure wise. Nice hostel with clean room and facilities. Only downside, there was a group of school kids from Europe on the floor above us who kept making really loud noise like jumping off beds, the ceiling was shaking and so were the pipes in our rooms. We completed to staff numerous times and nothing was done. This could somethings go on til 2am and I was woken up numerous times. Nice cafe next to the lobby. Luggage storage in basement for $5. 100% recommend this place, honestly this was the best hostel I’ve ever been to (full disclosure; the only other hostels I’ve been to were in Thailand so they weren’t the cleanest). Instead of saying the typical positives, the underrated extra that I feel like no one would mention: s**tting here was perfect, silent af. No one will hear you p**ping, don’t know how they managed to do that but never felt p** shy because of it. However to be picky, school groups were loud but worth it in comparison. Great location! On the Upper West Side so it's away from the commotion of downtown. However, super easy to get around with a few subway and bus options close by. My fav part was the mini cafe set-up in the dining area. After a day of walking I was sore and thankful to have food close by and spend one night in. Great food options! Only problem was I had to change rooms a couple of times. Great rooms, but there has to be a better way of managing them. Overall would def stay here again! I slept in the 8 person mixed room, it was a bit noisy, but it's a hostel. Good if you just need a place to crash for the night. Overall good hostel in Manhatten, probably the cheapest bed on the island. Well run facility, clean rooms and bathrooms, and lots of activity' at a reasonable price. The best entertainment was the stand-up comedy show, don't miss it if your staying at hi New York. I moved out after one night. No one really asked why, so either it’s not interesting or nothing special. My room was on the first floor, next to the “trash room”, it smelled like fish, the bath was closed and my keycard wasn’t working in the middle of the night.